MINI Life in Charleston: New Friend from Canada! 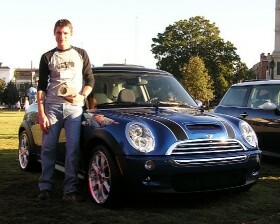 A BIG MINI (haha) welcome to Christina from Ontario, Canada, to MINI Life in Charleston! Please make it a point to check-out Christina's blog (under "Links" to the right). Geez, it looks cold up there! Morris likes it down here in sunny Charleton. thanks for the shoutout!! it's actually not cold anymore... it's been the warmest winter on record for us: today, new years eve, is 4*C with RAIN!! last year was snow at this time...!